You know that there are different storage units that you are going to use in your lifetime. There are some that you can use once you are provided with your own lock but even though there are locks provided, you are still not exactly sure if it would remain safe. There is always a possibility that a seedy person has the key to access the lock you have placed in the storage unit. You do not want to end up losing items just because of this, right? Having your own lock that you can use every time you need to use a public storage facility will be ideal. Finding the right lock can be complicated though because there are so many that are available. How will you choose the one that is right for you? Avoid purchasing locks from stores that sell cheap merchandise. There are some locks that you can purchase from dollar stores that may seem sturdy but they are cheap because the locks are easy to tamper. The locks you should buy may be a bit expensive but they will be great investments in the long run. Do not have just one lock. You can invest in different ones that will best fit the storage facility that you are going to use it on. For example, the sizes of the locks you are going to purchase may vary. Be familiar with the different locks available so that choosing can be easier. Not all locks are made the same. Some will protect your storage unit and your items better than others. Combo Locks – These are locks that would require a code when you unlock it instead of using the key. The great thing about this is you do not have to carry a key with you. Just do not forget your password otherwise you need to contact a locksmith to open it immediately. This is ideal for people who always lose their keys but do not forget their codes. Padlocks – This is the most popular type of lock that everyone is familiar with. There are so many types available and some may be easier to cut more than others. If you like padlocks, stick with tried and tested brands. The bigger the padlock is, the better it would protect the storage unit from being opened. Disc Locks – This is the most trusted type of lock when it comes to storage units because it is difficult to cut. Just make sure that you do not lose your key because it will be very hard to get the items that you have placed inside the storage unit if ever. Weather-Proof Locks – Based on its name, you can already guess that this is a type of lock that you can ideally place in an outdoor storage unit. This looks like a padlock but the metals used to create this lock is different. It can keep your things safe and secure. Abus Granit – This is a type of lock that is known to be very secure. The core itself will be very hard to pick so even if people would try to open it, it will not be easy at all. If in case a thief is able to open this lock it is either the person has the key or the person has years of experience in picking locks prior to checking out this lock. There are two cuts needed just to remove the lock from the storage unit. American Lock A700D – If you want something simple but will give extra protection to the storage unit that you are using, this is the best option to try. The body of this lock is thicker than the usual locks. They also use 5 pin cores so thieves may find it a bit hard to understand if they would try to pick this lock. If you are on a budget but you want extra protection, this is probably the best one for you to pick. Best Access Systems 21B – The brand is known to create good quality padlocks and this is one of their products that you should try. It has hard shackles that will be difficult to cut. This is ideal for large storage units that you can find in commercial buildings. This lock option is also great if the storage units are outside as this padlock is weatherproof. Mul-T-Lock MT5+TR 100 – When you see this lock for the first time, you may not think that it is a lock because of how it looks like but it can fit some storage units easily and you can also expect that your items will be well-protected. This lock is made solidly and it will be nearly impossible to cut through the shackles. EVVA MCS – This is known to be one of the most secure locks that you should have right now. It has a magnetic key system which is not readily available to normal storage locks. This is made out of steel alloy and probably its best feature is that it looks like the usual locks that you can see but the only difference is, this will be hard to cut. 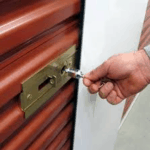 This is the best lock to use for a storage unit that is seen readily by the public. Ingersoll 10 – Do you want a lock that is nearly impossible to open? If you answer yes then this may be the right one for you. This has a core that will never be opened unless the right key is used. The lock body is thick too. Just by looking at it, you already know that this is a solid lock that is worth investing in. Based on the different locks that you can use on your storage units, which one are you most excited to purchase?